Shopping for a new FIAT 124 Spider? The Fiat 124 Spider has excellent handling even while it delivers an absorbent ride; try the Abarth model for the finest grip of the family. Agile handling and a composed ride balance out the 2019 Fiat 124 Spider’s slightly laggy turbo-4 engine. With the 124 Spider, Fiat grabs bits of its sports-car heritage from the 1960s and applies them lightly to a Mazda MX-5 Miata chassis. Drop in a turbo-4, tune the handling just so and–ecco!–the Spider’s reborn. 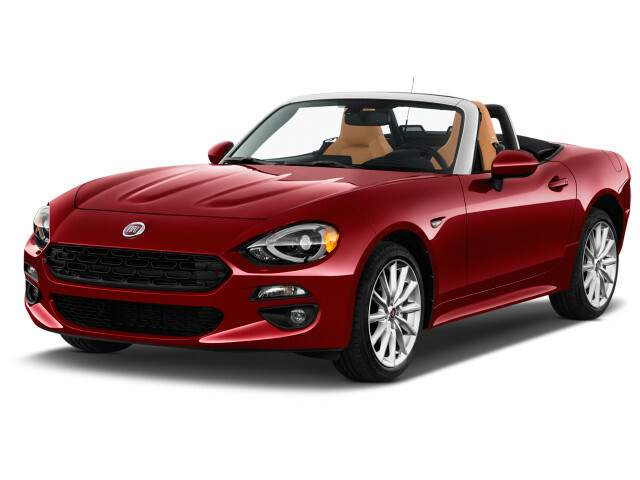 Built in Japan, massaged via remote from Italy, the 2019 Fiat 124 Spider does what the Miata does, with slight differences in the engine and styling department. With almost no change for the new model year, the Fiat 124 still sends a thrill up the enthusiast pant leg. It telegraphs its intent from the nose on back. The honeycomb grille and pert rear end remind onlookers of classic Fiats and of the new Miata, which means the stylists did their job well. The cabin’s cozy but generally better appointed than the Miata, save for the infotainment interface and its eminently chuckable roller knob. Fiat diverges from the Miata game plan under the hood. It sends home the Mazda 2.0-liter inline-4 and fits its own 1.4-liter turbo-4, good for 164 horsepower in Abarth versions, slightly less in Lussos and Classicas. The Mazda’s quicker (especially now, after an engine-room rework), but though the Fiat turbo-4 has some noticeable turbo lag it still punches the 124 through the air with glee, particularly at highway speeds. Take the 6-speed manual, but if you get the 6-speed automatic the Abarth model adds shift paddles—just saying. In any trim, the 124 Spider has the poise and driving verve the current Miata pulls off so well, with a comfortable ride that denies its stubby 90.9-inch wheelbase any chance for mischief. It’s light, at just 2,436 pounds, and it’s exceptionally light on its feet. With no crash-test data, the 124 Spider is a safety unknown. It’s equipped with a decent features list, but automatic emergency braking’s nowhere to be found. We’d opt for the Lusso and its reasonable set of gear, which includes leather and a bigger infotainment screen, but enthusiasts will demand the Abarth’s tighter tuning and more raucous exhaust. The 2019 Fiat 124 Classica costs around $26,000, while Abarths sticker at more than $30,000. 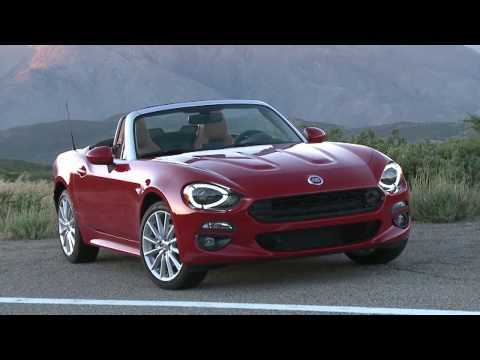 The Fiat 124 Spider dabbles in history, but doesn’t let it get in the way of a good time. Fiat and Mazda deserve credit for the different style applied to the related 124 Spider and MX-5 Miata. Fiat riffed on roadsters past to bring the 124 Spider into a new era. Some of the cues echo those from its various roadsters from the ‘60s, and it doesn’t share anything with the Miata, in terms of sheet metal. The Fiat 124 even sits 5 inches longer than the MX-5 and has longer front and rear overhangs. The differences leap off the front ends of the cars. The Miata’s scowl turns into a high-set honeycomb grille on the 124 Spider. Eyelid-shaped headlights with available LED lighting define the front corners, and a big air intake is flanked by foglamps split along the horizontal. It’s an homage to the classic 124 Spider, down to the concave stamping in the hood that inverts the power-dome bulges from the vintage classic. The differences get more pronounced toward the rear. Where the Miata sags and tapers, the Fiat stands upright and calls attention to the width of its rear end. It’s pretty, but not quite as in-your-face as the Mazda despite touches that distinguish different models: the Classica’s body-color-and-black trim, the silver Lusso touches, and the gunmetal gray on Abarths, sometimes paired with a black hood. Fiat pays more attention to interior finish than Mazda does. The simple sports-car shapes have better materials, particularly on the dash and door caps and on the instrument binnacle. Mazda puts body-color plastic on the tops of its doors inside the cockpit, but Fiat applies soft-touch plastic. Could we have both? 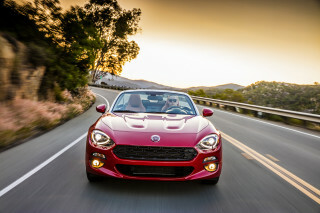 The 2019 Fiat 124 Spider spins driving joy from a turbo-4 and sweet handling. The Fiat 124 Spider doesn’t come about its lively performance in quite the same way as the related Mazda MX-5 Miata. Fiat relies on turbocharging, for one, and that gives it less a boost than expected. Both Mazda and Fiat put 4-cylinder engines to work under the hood of their related sports cars. The Mazda’s engine has been updated this year, but remains naturally aspirated, with 2.0 liters of displacement and 168 hp. In the 124 Spider, Fiat turns to a single-overhead cam, turbocharged 1.4-liter 4-cylinder. Fired up with as much as 22 pounds of turbo boost, it can belt out 160 hp and 184 lb-ft of torque in base cars, or 164 hp in the Abarth model, thanks to a less restrictive exhaust system. 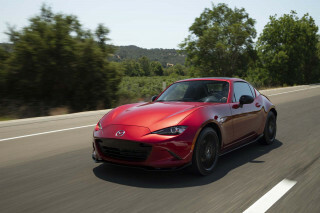 The Miata’s been the stronger of the pair, and it’s become stronger this year with significant revision to its engine. The Fiat’s unchanged, and though it takes just 6.8 seconds to reach 60 mph from a standstill it flinches for a moment off the line, until its turbo lag dissolves in a flurry of spooling action. The lack of low-end power grows more noticeable on automatic-transmission Spiders. Shift paddles help–but only the Abarth model has them. The 6-speed manual helps cut through some of the lag, and it switches gears with smart, clean action. On the highway, the 124’s blessed with strong passing response, thanks to the turbo. The Fiat 124 weighs about 100 pounds more than the Miata but both are lightweights. The 124 checks in at 2,436 pounds, which lets it dip from curve to corner with light-footed moves. It’s very willing in corners, and the ride quality remains supple: Fiat tunes it to use body lean to absorb some of the impacts from the road. Once the steering is pointed and the suspension takes a set, the 124 Spider rotates crisply, and that body lean translates into feedback. It’s a predictable, precise car to drive near its limits. That softer suspension tune also leaves room for the Abarth model’s tweaks, which include a strut tower brace and Bilstein shocks. The tweaks only make the Abarth quicker to turn in and more responsive to driver inputs. Short trips for two people put the Fiat 124 Spider in its best light. 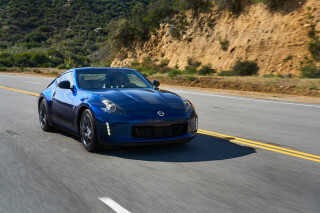 Sports cars don’t fare well in comfort and utility, as a rule. The Fiat 124 Spider does just fine when only two people are involved, and if they’re not very attached to material possessions. The 124 Spider has just two seats and they’re formed from netting and urethane instead of springs, as firmer seats might be. They can be comfortable for a few hours, but over long distances the support isn’t enough. In terms of human space, this generation of Miata/Spider does better by passengers than previous ones. The seats sit lower and offer more stretch-out leg room, with just enough head room under the convertible top for 6-footer comfort. In the cockpit, the Fiat’s controls and storage bins come up short. The Mazda-loaned infotainment system controller sits too far back behind the shifter to be used easily. A small bin behind the driver’s right elbow offers some of what little storage the Spider has. The cupholder system is more like a virtue signaling system: two movable cupholders fit in three slots around the car, taking up leg room from the passenger, out of reach for the driver. You’re either mad or you aren’t, and if you are, maybe a bigger vehicle suits you better. Fiat upgrades interior materials for the 124, versus what you’ll find in the Miata. Hard plastics on the tops of the dash and doors swap out for softer materials. There’s more sound insulation around the cockpit and under the car. Tire noise still makes itself known, and closing the roof amplifies some road noise. The Fiat falls flat in cargo space, too. The 4.9-cubic-foot trunk barely holds a single bag, but it’s a half-cube bigger than that in the Miata. The Fiat 124 Spider hasn’t been crash-tested. Fiat includes the usual gear here, and makes blind-spot monitors and rear parking sensors available on most models, as well as LED headlights. No 124 offers automatic emergency braking, a feature we consider essential. We will update this section if the 124 Spider is run through crash tests, but it’s unlikely, given its low sales volume. Modestly configured in base trim, the 2019 Fiat 124 Spider has real sports-car value. Fiat sells the 124 Spider in Classica, Lusso, and Abarth editions. In all, the 124 Spider has a moderate amount of features, with a relatively lean options list that now includes a sport exhaust and new stripe kits for 2019. On the base Classica, Fiat gives the 124 a six-way driver seat and a four-way adjustable passenger seat, power features, air conditioning, cloth upholstery, keyless entry, cruise control, 16-inch wheels, tilt steering, and a four-speaker AM/FM audio system with Bluetooth and USB connectivity and a 3.0-inch display. Options include satellite radio, a 7.0-inch audio display screen, and a version of the infotainment controller we’ve sampled and disliked on Mazda’s roadster. It’s an outdated wheel-control system that requires too many steps to change stations or sources. It needs a reboot. Lusso Spiders gain automatic climate control, fog lights, 17-inch wheels, and heated leather seats. Options include LED headlights, a nine-speaker Bose audio system, and navigation. Abarth 124 Spiders are our pick of the lineup. 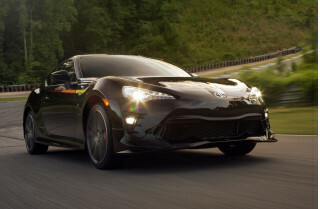 They add a limited-slip differential and Bilstein shocks, a sport mode selector on automatic-equipped vehicles, firmer suspension tuning, leather seats, and a special steering wheel and gear shifter. Abarth options include Recaro sport seats, a hood stripe, and uprated Brembo brakes. Other options include blind-spot monitors, rear parking sensors, and heated side mirrors. Fuel economy is the small car’s forte, and the 2019 Fiat 124 Spider doesn’t disappoint. With a smaller-displacement engine than the similar Mazda MX-5 Miata, the 2019 Fiat 124 Spider has delivered no better fuel economy. The EPA rates the 2019 Fiat 124 Spider at 26 mpg city, 35 highway, 30 combined. 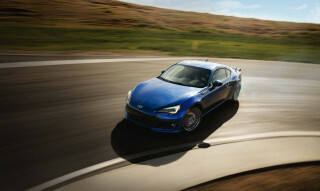 That’s how we’d order it; with the available 6-speed automatic, it’s rated slightly lower, at 25/36/29 mpg. Fiat says it’d like drivers to fill the 124 with 91-octane fuel for top performance. It’s advice well taken; we’ll just put back some of these gas-station snacks. Looking for a different year of the FIAT 124 Spider?